Oh, you don’t eat breakfast? SHAME ON YOU! Seriously. I am about to go all Jillian Michaels on you. Believe it or not I am an actual personal trainer. I don’t just play one on the internet. Nothing would ignite my angry fire quite like a client telling me they don’t eat breakfast. If they would get to me in the morning and tell me they didn’t eat breakfast I would tell them to go home. As someone who loves to eat I don’t even understand this concept. From the moment I’m conscious in the morning, before I even open my eyes, I’m thinking about what I’m going to stuff my face with first. What’s wrong with you people???!!! I know time can be hard to come by in the morning. I get it. Making a decent breakfast takes time you don’t have. Lucky for you, I have a solution. Overnight Oatmeal. It takes a few minutes in the evening before bed and then a minute the following morning. Breakfast: Done. There is an ingredient in this oatmeal you may not recognize. Cha cha cha CHIA! Yup, same stuff. Those seeds you lovingly spread on the “pottery that grows” are actually food. Chia seeds are PACKED with nutrition. Ounce for ounce, it has more Omega-3 fatty acid than salmon and also has high amounts of Omega-6. These Essential fatty acids build new cells and aid brain function. Also, an ounce (2 tablespoons) of chia seeds contains 18% of your daily recommended calcium intake as well as provides 4 grams of protein. Take that dairy! Chia seeds are tiny and crunchy. You can add some to your salads or even put in water. If they are in liquid they swell up to 12x their size. They get a gelatinous (yeah, I said gelatinous) texture and can be hard to drink. By putting them in the oatmeal you won’t really know they are there. They have a slightly nutty flavor but it’s very mild and hard to detect. 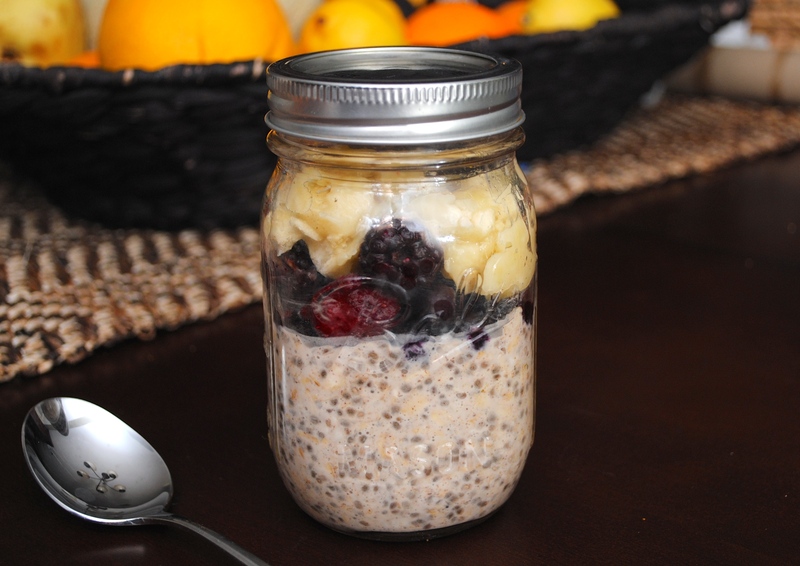 Combine oats, almond milk, chia seeds and cinnamon in jar and shake up. Put in fridge overnight. Go ahead and tell me you don’t have time for that. In the morning grab and go. You’ll notice there is a lot of options up there. Add whatever you prefer. I personally like my overnight oatmeal with a little bit of raw honey and that’s it since I’ve usually already had a little fruit in my juice. The banana and berries are the ones I’ve tried with this and it’s yummo. I like mine warmed up for about 45 seconds in the microwave but it’s also good cold. If you read this and still decide not to eat breakfast it’s over between us. Just kidding! I’ll be sad though so just do it. Note: Chia seeds are becoming more widely available. They are least expensive in the bulk bins at health food stores. Keep in mind you only use a tablespoon at most at any given time and a little goes a long way. Looking for something for din din? Look no further…Try this Veggie Lasagna! Be sure to like greensypants on facebook and follow on twitter so you know when there is more greensypants info to soak in! Share with your friends and the green will keep coming your way!